“Our planet is sick and we cannot remain healthy in a sick planet”, said Dr. David Servan Schreiber. If one delves deep into the statistics we would be alarmed at the exponential rise of critical diseases in the past few decades. Air pollution, water pollution and food contamination are the major contributors to this. The food we consume every day is laced with pesticides, especially the fresh consumables like fruits and vegetables. Organic food products without pesticides have come into the market, but, with a generous pocket pinch. But can we vouch and say that the organic food items are really as it is made out to be. Where is the proof of such tall claims? Some of the world’s largest food companies like Walmart, Dole and Nestle have started work with Blockchain technology to help improve food safety. These companies strongly believe that this technology will allow them to better track their items within the global food supply chain. A new era of end to end food transparency is expected in the system from the suppliers to store shelves and ultimately to consumers. Among the major issues that ought to be addressed, is food contamination due to toxins, insects etc, or food spoilage due to temperature, humidity, and expiry. It often takes months to identify when and where a product was contaminated. Meanwhile, the same contaminated product might reach the consumers plate or be unnecessarily thrown away as a precaution. According to the Food Safety and Standards Authority of India, one in every five samples of food items tested by the public food safety labs in the country was found to be “adulterated and misbranded”. One can easily recollect the recent incident of nationwide food recall in USA of vegetables infected with listeria such as broccoli, cauliflower, Brussels sprouts and mushrooms. A Blockchain can be used to keep track of every single change that happens to a food item, hence making it far easier to find out where a shipment of a particular product has been, or at what point in the supply chain was it tampered with. Such valuable information can potentially prevent major outbreaks of foodborne diseases and also reduce food wastage. Blockchain technology could represent a legitimate option for farmers too, who feel compelled to rely on middlemen to sell their commodities. The use of Blockchain could prevent price coercion and delayed payments in the food supply chain. It should also allow farmers to be fairly and quickly compensated as market data would be readily available and validated. 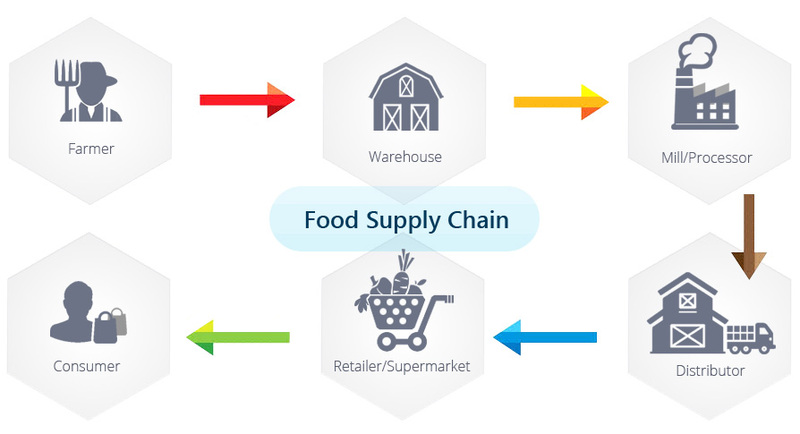 Finally, with the inherently decentralized properties of Blockchain technology a complete picture of the food chain will be visible to all stakeholders. Producers and suppliers will be able to track their shipments and make more efficient decisions, while increasingly socially aware consumers will be able to see exactly where their food has come from, rather than having to trust misleading and confusing labels.